Foot Skeletal Structure. 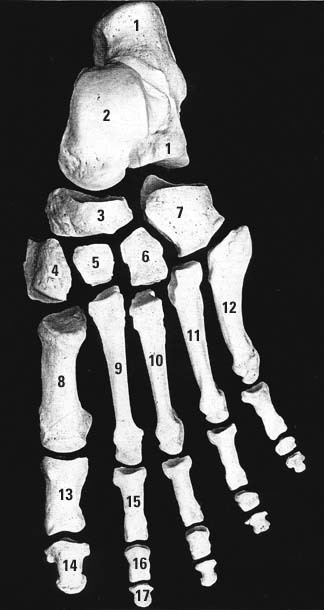 The disarticulated bones of the left foot, from above (The talus and calcaneus remain articulated). Tibia: Latin for a flute or pipe; the shin bone has a fanciful resemblance to this wind instrument. Fibula: Latin for a pin or skewer; the long thin bone of the leg. Adjective fibular or peroneal, which is from the Greek for pin. Tarsus: Greek for a wicker frame; the basic framework for the back of the foot. Metatarsus: Greek for beyond the tarsus; the forepart of the foot. Talus (astragalus): Latin (Greek) for one of a set of dice; viewed from above the main part of the talus has a rather square appearance. Calcaneus: from the Greek for heel; the heel bone. Navicular (scaphoid): Latin (Greek) for boat-shaped; the navicular bone roughly resembles a saucer-shaped coracle. Phalanx: Greek for a row of soldiers; a row of bones in the toes. Plural phalanges. Sesamoid: Greek for shaped like a sesame seed. Digitus: Latin for finger or toe. Digiti and digitorum are the genitive singular and genitive plural -- of the toe(s). Hallux: Latin for the great toe. Hallucis is the genitive singular -- of the great toe. Dorsum: Latin for back; the upper surface of the foot. Adjective dorsal. Plantar: adjective from planta, Latin for the sole of the foot.